Thank goodness for ballet flats. Feminine, stylish, affordable, and they don't kill your feet or your back. 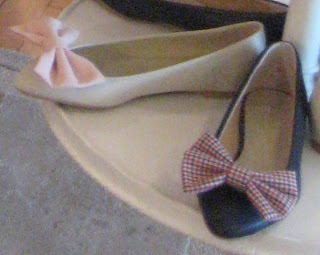 I stumbled upon Chocolate Shoes and their lovely designer on Queen Street West this weekend. In pastel colours, pok-a-dots, bows, ribbons, floral patterns and other pretty details - I was dying to take every pair home with me. I love the pix u took. My shoes look even prettier in ur photo. Thanx alot. We've been open for just a week and this is great!! thanx.